Magic Chain Stitch is a fun light hearted stitch that both children and adults love. It is called Checkered or Magic Chain because it changes colour. It is useful to use on small gifts, items like Christmas tree decorations, purses and bags etc. This stitch can hold a curve well. I have seen magic chain stitch used to embroider text which since it is a variety of chain stitch it handled well. As a stitch it is reasonably hard wearing so if you wanted to teach it to a child they can use what they make without fear of it becoming too tatty in minutes. I discovered magic Chain Stitch in Jacqueline Enthoven’s The Stitches of Creative Embroidery (p 132) so … this is a real stitch I am not pulling your leg. The sample is worked in two threads of perle #5. I used a tapestry needle so I could thread both colours in the needle with ease. Thread your needle with two contrasting colours. Make sure both threads are the same length. Start the line as you would ordinary chain stitch but loop only one of the threads under the needle. 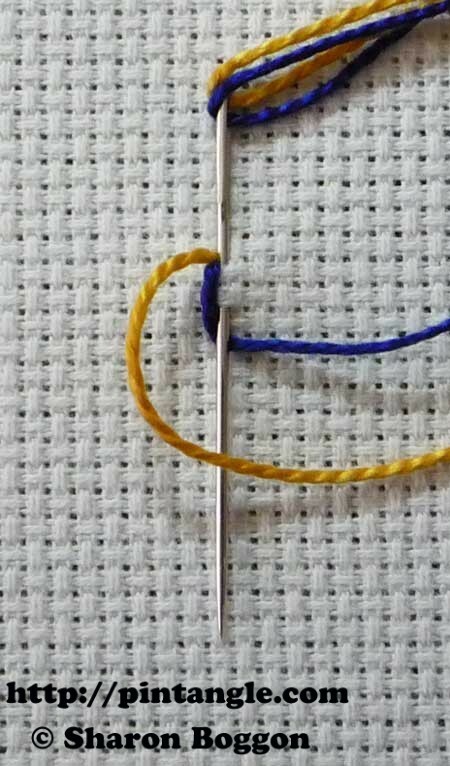 see in the illustration how the blue thread is under the needle and yellow is not. Pull the thread through the fabric. While you do this make sure the tension is the same on both threads as you pull. Make the next chain stitch but use the contrasting thread. See how this time, the yellow thread is under the needle. Pull the thread through to make the second chain stitch. Continue in this manner alternating the two colours. As you can see you end up with a line of stitches made of two colours! This is a fun stitch. I hope you enjoy it and share it with your friends. i had fun with this stitch and managed to work it into my christmas stocking project as well as another piece. Fun stitch but one I’d probably use infrequently because of the constant fussing which made me nervous and my fingers feel like sausages. I ripped out frequently, lost patience and became frustrated with my too often sloppy results. On the plus side I did work with 4 threads. Here’s my Mgaic chain stitch sample. Was a funny stitch but a little bit challenging for me with two metallic threads in the needle. I’m not a TAST participant, but I do stop by and see what’s up. I’m always amazed to see the different directions a single stitch can take with all the stitchers. I’ve seen (OK, I bought) a double eye needle. The catalogs showed it next to something similar to this stitch. Is that needle’s purpose to make this stitch easier somehow? I’ve never tried the needle yet, so I’m just wondering if it’s a solution in search of a problem or if it does magical things. I cant see how a double eye needle would make this any easier. 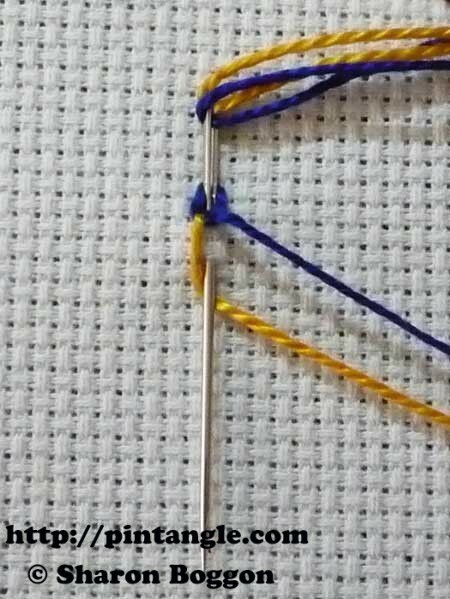 You can use a double eye needle to mix two threads together (and you can do the same thing by threading the two together in the eye) but with this stitch one thread stays at the back of the fabric. I have never tried using one for this stitch I will have to try but I cant really see an advantage- I could be wrong however. Back in January I used this stitch with two slightly different shades of green. It was hard to see the difference. I tried out of this stitch , Can be viewd in my blog. I think the stitch of this week is more difficult than it looks, but it is funny. Here is my Magic chain stitch sampler. I enjoyed this weeks challenge. Here is my small sample. plus the catchups. Funny how being late influences the thinking. I completed the stitch for week 45. I am sorry very sorry. I missed some of the challenges. Due my ill health and eye problem, i was not able to make it attempt. I who never fail to try your stitches for the all weeks and never miss to enter other sites to woun der what they had done. This is the wounderful site to enjoy hoe stitches are being used inan very imaginatery forms. I really used to enjoy. But……….. sorry i missed some weeks. But sure will catch soon. ai will post this stitch soon because i love todo it. No need to say sorry everyone understands is health or a busy life means you cant do it. I am sure you will catch up when you can. Hi! I have no time for stitching your wonderfull suggestions, but I follow with pleasure your posts, I learn your tecniques, and I wonder watching the great ideas of your followers! What a fun stitch! You’re so clever.